Women are underrepresented in the fields of physics, astronomy, and engineering. Some say more needs to be done to spark young women’s interest in science, technology, engineering and math. Women in science have worked hard to break down the barriers to entry, in what was once a very male-dominated industry. Although careers in science are now popular with both men and women, efforts still need to be made to encourage more women to pursue their scientific passions. Wentia Ford, a Health Sciences instructor at South University — Virginia Beach, became interested in science at a young age. Although science was not traditionally viewed as a popular career path for women, Ford believes a great deal of work has been done to conquer this generalization. “In today's society, women have overcome many stereotypes in certain ‘male dominated fields’ and have overcome many of these obstacles to efficiently pursue any scientific field of study,” Ford says. While women in science have come a long way, Donna Dean, the former president of the Association of Women in Science, says she thinks it’s still a struggle in many places for women with careers in science to be treated as equals. Women interested in a scientific career can benefit from early mentoring and exposure to basic science subjects in high school. She says the misconceptions that girls don’t do math, or can’t do science, are still out there in many places. “I think we’re doing a pretty good job through most of the secondary education,” says Dean, who has held scientific positions at the National Institute of Health and the Food and Drug Administration. Figuring out what’s weeding the women out of careers in science is not an easy problem to solve. While they may have done well academically, some women face major challenges in their careers. Does Gender Make a Difference When Choosing Careers in Science? “In the past, males surely dominated scientific careers and the more challenging medical careers,” says Sharon Best, a Health Sciences instructor at South University — West Palm Beach. “However, this is not so in the present time. The class accepted into the Miller School of Medicine at the University of Miami, this year was female dominated, which has never happened before. Fifty-one percent of the class of 2015, whom are projected to graduate as physicians, are women." 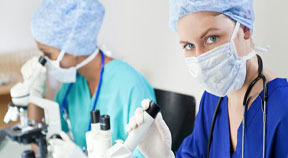 Although there is a near even gender split in medical school, Best says that after graduation, male and female doctors often embark on separate career paths. “In regard to medicine, most surgical specialties are male dominated, whereas females tend to outnumber their male counterparts in the areas such as pediatrics and obstetrics and gynecology,” Best says. Although medical careers are no longer male dominated, Dean says the physics, astronomy, and engineering areas of science still employ a much higher concentration of men. Dean says that women interested in science need to know that there are many different types of careers that they can go into. Women in science have traditionally faced many obstacles when pursuing their careers. Dean says it can be difficult to juggle the demands of having to be in the laboratory or out in the field doing research, when you have a family. “These are not necessarily 9-5 jobs,” Dean says. Best, who is the mother of six children, agrees that it can be difficult for women in science to balance their work with a family, but she wants women to know that it is achievable. Best says that she manages to have both a family and a scientific career by keeping her priorities in order. Dean says there are not enough role models, like Best, for young women hoping to start a career in science to model themselves after. Dean believes that scientific companies have made progress with encouraging women to join their organizations. Many have developed family friendly policies, clarified their career progression policies, and ultimately recognized the need for a diverse staff. Working for a company is one thing, but success in academia can be a totally different story. Dean says it can be much more difficult to be a successful scientist when working in academia. Competition for tenured positions can be intense and require a lot of work even after you have secured one. Ford says in order to pursue a career in science one must have the natural desire, passion, and love for science. Best believes women in science can encourage others to follow the same path by setting a good example for them. “When we are truly happy in the day-to-day activities of our jobs, it shows, which will entice others to follow in our footsteps,” Best says. Dean agrees that women working in scientific careers should encourage others to do the same. “More experienced women should try to talk to the early and mid-career stage women and let them know that no career is perfect, it’s hard but it’s not that hard if you have the aptitude and love what you’re doing,” Dean says.